In 1957 Pastor Bob McClure was led of the Lord to resign his pastorate and radio work in Bristol, Virginia, and return to his home town, Greenville, South Carolina. He and Mrs. McClure built their new house in the "Morningside" subdivision of Greenville. After a short time, God burdened his heart and the hearts of a few other interested saints that "our side" of Greenville needed a Bible-believing Baptist church. After much prayer and seeking the "mind of the Lord,” they felt led to "move ahead" with the founding of Morningside Baptist Church. Thus, the church was born and began meeting in the living room of the McClures’ home, located at 4 Estanolle Drive just off Richbourg Road. Pastor McClure writes, "In Proverbs 8:34, God says, 'Blessed is the man that heareth me' (When I listen, He talks!). I listened and He said, 'with my help and leadership build a church that will be 1) A friendly church, a warm-hearted, caring church, always with a warm Morningside handshake of love to all people 2) a fundamental, New Testament church, proclaiming the Gospel in power, autonomous, missionary, with Jude 3 in mind, always preaching the book, blood, and the blessed hope 3) an educational church, teaching the whole Bible 4) a musical church, with good spirit-filled music 5) an evangelistic church in practice and outreach All of this is needed as a foundation to a busy growing, glowing, prosperous New Testament Church. God did it all! To Him goes all the glory and honor and praise! As the great hymn says, 'I stand amazed in the presence of Jesus the Nazarene'." Morningside Baptist Church had its beginning in the living room of Pastor and Mrs. Bob McClure in October 1957 with eight people present at the first meeting. The group continued to meet in the McClures’ living room and later moved to their basement. In August 1958 the as yet unincorporated congregation began to meet in a small house on Fisher Drive. This house has since been torn down to make a right-of-way for Duke Power Company equipment. In September, the group erected a tent on the site of what became Alexander's store, and evangelistic services were held with Rev. Rufus Mitchell as the evangelist. In October 1958 the church was incorporated according to the laws of the State of South Carolina. Mrs. Catherine Inglesby Fisher was the first convert after the church was incorporated, and she became one of the charter members. Another important event in 1958 was the purchase of the property on East North Street. It consisted of two lots and a small frame house that was purchased for $11,000. The congregation held services in the house which stood where the parking lot was later located. Membership in 1958 reached 57. The congregation began praying and planning toward building a church sanctuary. The church faced many difficulties, including much opposition from homeowners in the community who did not want a church built in their residential area. The pastor and board members contacted the homeowners and presented to them the church's statement of faith, the goals for a future attractive sanctuary, and their certain belief that the Lord wanted the church in that neighborhood for the purpose of proclaiming the Gospel. The new building was primarily designed by Pastor McClure with some help from others. The final designs and plans were drawn up by an architect who was the brother of Cecil Edwards, one of the first deacons. Ground was broken in 1960 and the building, begun. Some difficulties developed with the contracting work, but the Lord overruled and the basement was completed and occupied in 1961. The church then sold the little house for $500, and it was moved away to make room for the parking lot. The sanctuary on East North Street was first occupied in 1962. Since then many improvements have been made. At first metal chairs were used in both the basement and the auditorium. In the mid-60s the pews, pulpit furniture, and choir seats were installed. Pastor McClure designed the pulpit and had it built. Later Mr. Clyde Howard reworked it to match the pews. In 1967 the piano and organ were purchased, and in 1968 the carpeting was installed. The East North Street property was completely free of debt when Pastor McClure resigned in 1972. In the early 80s when the congregation began to outgrow the seating capacity, the metal chairs were moved from the balcony and folding theater-style seats were put in. Additional seats were also added in the choir loft and the platform extended to accommodate them. A new public address system was designed and installed by George Rogier, and the organ console speaker was placed into the wall above the baptistery window. In order to make more space for Sunday School and for choir practice, the church began to the use the YMCA quarters next door as well as two rooms in the Medical Center. Junior Church was also begun in the YMCA so that more space in the auditorium would be available for the growing congregation. In August 1974, property on Strange Road in Taylors, consisting of a house and over three acres of land, was purchased for $33,500. Under the leadership of Pastor Looper, the new property was financed by a cash down payment and the selling of $23,000 worth of bonds to the church members. By the time Pastor Looper resigned in 1977 there was money on hand to pay off all the bonds that were still outstanding. The house was used for several years for homecomings, young people's meetings, and other church related activities, including temporary housing of missionaries while home on furlough. After Pastor Kaster came and the need for expansion was evident, it was felt that the property on Strange Road was not suitable for future church growth, and it was sold in 1981 for $46,500. In 1981, after a diligent search for land suitable for an expansion program, Morningside Baptist Church purchased a six-acre tract on Pelham Road just two miles beyond the East North Street building. 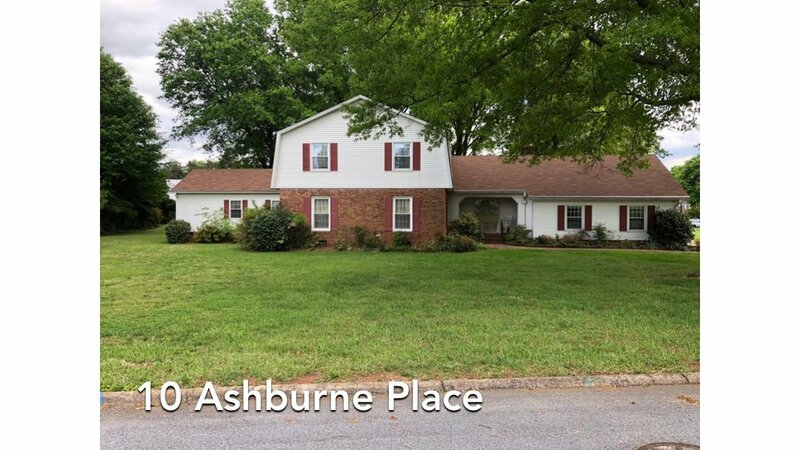 The acreage is a beautiful level tract in a residential neighborhood. The church paid $135,000 for the land, with $40,000 down on the property and obtained a 15-year, 11% loan on the remaining balance. The building on East North Street was listed for sale, and a new facility was planned when the sale was completed as the Lord opened the way. Meanwhile, as Morningside was "bursting at the seams," the church was thrilled when in September 1983, larger facilities became available at 2701 Wade Hampton Boulevard in an abandoned church building. In just a few days equipment was moved to the new location and the people were praising the Lord that there was now room for expansion. The newly rented building seated three times as many people as the former building and had a floor area of 14,500 square feet. While the church was in the Wade Hampton facility, the church was able to purchase additional Pelham Road frontage property that included a house and its accompanying land. This completed the Pelham Road property purchase. The new building at 1115 Pelham Road was occupied in May 1988. This building included a 500 seat auditorium, office wing, nursery facilities, and three Sunday School classrooms. A new addition to the Pelham Road property was completed in the summer of 1993 and included a full-size gymnasium, more nursery facilities, a fellowship hall, a kitchen, and approximately 12 Sunday School classrooms. Phase three of the building on Pelham Road includes the present auditorium, additional nursery facilities, meeting rooms, Sunday School classrooms, and unfinished sections to be completed later. The Hogate wing of the new auditorium wing includes 11 classrooms on the two floors of the west side of the building and was completed in the summer of 2000. This wing is dedicated to the memory of Lewis Hogate who was a deacon and who was taken to be with the Lord in a tragic motorcycle accident. The Harvey wing completed in the fall of 2001, is made up of the second floor south side of the Auditorium wing. This section is used as classroom and music space complete with choir and instrumental practice rooms and a music library. On July 17, 2016, Morningside voted to finish the South Wing. The college group had grown to over 200 students. So a 4,900 square foot wing was opened to allow them to meet for Sunday School small groups on Sunday morning and for the youth group to meet on Wednesday nights. The college group, Rooted, continued to grow and in 2017, split into two separate classes to coincide with the two morning services. Offering the same worship services in the auditorium and college classes in the South Wing twice back-to-back allowed the congregation and college group to continue to grow. On June 4, 2017, Morningside voted to finish the last unfinished wing of the church building after almost 20 years. Because the youth group had grown from 40 to 100 students, the East Wing provided a beautiful space for the Morningside teens to have meals, activities, teaching, and worship. An adjacent kitchenette also provides the ability to have food for hungry teens. And because of the rapid growth of the youth group, an adjacent classroom allows for the middle school students to have their own space for teaching and small groups. Morningside’s buildings now provide over 90,000 square feet of space for evangelism and discipleship to the glory of God! On September 24, 2017, the Morningside church family celebrated being debt free in the morning services. The Lord used the congregation's faithful giving and the leadership's fiscal responsibility to pay off the debt early and free up significant resources for greater vision. Pastor Crockett preached on "Remembering God's Work." from Joshua 3-4 recounting Morningside's history and giving praise to the Lord for His work. At the end of both morning services, Pastors Crockett and Miller burned a copy of the mortgage note. On May 13, 2018, the Morningside family voted to purchase three adjacent homes to the church. These three properties added three acres and 8,800 square feet, along with garage space for 10 cars, four patios, a workshop, and over 20 mature trees. Because of a significant increase in giving due to church growth and having paid off the debt a year early, Morningside was able to purchase all three properties without incurring any debt. Thanks to the estate gift of the Kennedy family, the church had funds to renovate two of the homes for missions and ministry guests. On September 21, 2018, the final phase of the parking lot was finished providing 40 additional needed parking spots. John Robert McClure and Carolyn Frances McClure are the parents of five children: John Robert, James Steven, Carolyn Leight, Jonathan Taylor, and Mark David. Pastor McClure was born April 15, 1926. His educational background includes a BA degree from Bob Jones University and an MA Degree from Mars Hill College. He attended Moody Bible Institute and holds the Honorary Doctor of Law degree from Florida Research, and the Honorary Doctor of Divinity Degree from Fundamental Bible Seminary. Dr. McClure's present ministry involves missionary radio. His life verse is Philippians 1:6. The late Robert Edward Persson and Ada Frances Persson are the parents of three children: Robert E., Cindy, and Steven. Pastor Persson was born October 23, 1923 and went to be with the Lord on April 14, 1979. His educational background includes training at the University of Wisconsin and Bob Jones University. His other ministries include the pastorate of First Baptist Church, Elizabethtown, Tennessee; and the First Baptist Church, Fort Atkinson, Wisconsin. He served many years in the field of evangelism. Wallace Robert Looper and Mary Joann Looper are the parents of two children: Rick and Randy. Pastor Looper was born September 9, 1932. His educational background includes an MA degree from the University of South Carolina. Other pastorates were Midway Baptist in Pickens, South Carolina; Fairview Baptist in Norris, South Carolina; Roanoke Baptist in Liberty, South Carolina, and the Calvary Baptist Church in Belvidere, Illinois. He left Morningside to serve as a staff evangelist at Calvary Baptist Church. Pastor Looper's life verse is Ephesians 2:10. William Raymond Miller and Jennie Mae Miller are the parents of three children: Danny, Susan, and Tim. Pastor Miller was born February 3, 1936. His educational background includes the B.A. Degree from Dallas Bible College. Pastor Miller's other ministries were as pastor of the Kenderick Bible Church in Rush, Colorado. His present ministry is the Pastor of the Calvary Baptist Church in Sebastian, Florida. His life verse is Galatians 2:20. Max James Kaster and Linda Ruth Kaster are the parents of five children: Jonathan, Jennifer, Jefferson, Jacquelyn, and Joshua. Pastor Kaster was born October 25, 1941. His educational background includes training at the University of Wisconsin, College of Lake County (Illinois), Kenosha College (Wisconsin) and holds a B.A. degree from Bob Jones University. He served with the U.S. Navy on active duty for 14 years plus nine years in the Naval Reserve, retiring as a Chief Petty Officer in 1982. His previous ministries include the pastorate of Faith Baptist Church, Greenville, South Carolina; and Founder-Pastor of the Faith Baptist Church in Sweetser, Indiana. His life verses are Ephesians 6:18–20. Alvie C. and Julie McClaran are the parents of four children: Alvie III, Robert, Holly Jean, and Jordan. Al McClaran was born June 10, 1958. His educational background includes a BA degree and an MA degree. Pastor and his wife Jeanette, have three children, Marjeana Bednarski, Michael and Matthew and eight grandchildren. Under Pastor Miller’s leadership, the church weathered difficult spiritual and financial crises. Morningside also started an Arabic and Mandarin Chinese ministry, and Open Door Baptist Mission grew significantly. Pastor Josh Crockett has been serving as a shepherd since 2005. He graduated with honors in 2001 earning a B.A. in Speech Communication with a minor in Business Administration. The next year he and Karie were married in her hometown of Raleigh, NC after she finished her degree in piano performance. Pastor Crockett taught communication for three years while earning a master's degree in Counseling and a Master of Divinity. "God has richly poured out His grace in my life. He saved me at an early age, filled my life with godly mentors and family, allowed me to marry the love of my life and has blessed us with two daughters, Karis and Tessa, and two sons, Micah and Andrew." Under Pastor Crockett’s leadership, the membership and giving have grown significantly. On July 17, 2016, the church voted to finish a 4,900 square foot South Wing to provide a space for the rapidly growing college ministry. On June 4, 2017, Morningside voted to finish a 3,200 square foot wing of the church building for a quickly growing youth group. On August 27, 2017, the church began having two morning services to accommodate the growing crowds. On September 24, 2017, Morningside celebrated paying off the debt early. On May 13, 2018, the church voted to purchase with cash three adjacent homes with three acres and 8,800 square feet. On September 21, 2018, the final phase of the parking lot was finished providing 40 additional needed parking spots.